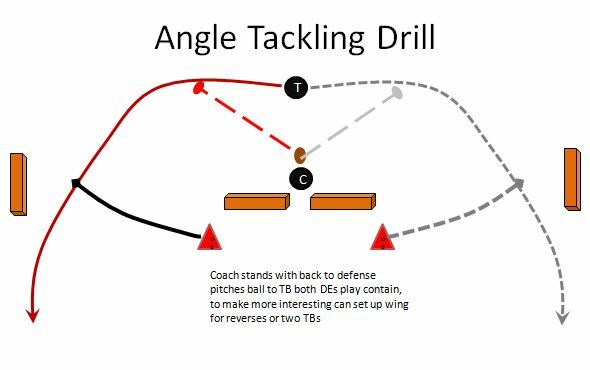 This season I have been using this Angle Tackling drill for my youth football team at almost every practice, especially for Outside Linebackers, Defensive Ends, Corner Backs, Free Safeties and Inside Linebackers. The drill is also great for tail backs to practice the sweep and cut back sweeps, and the RBs use of speed and the stiff arm. The coach pitches the ball to the tail back and the two defensive players play contain and or make angle tackles. Our youth football players love this defensive drill.